Christ Is Born! Tell Forth His Fame! This is the first Ode from St. Cosmas's Canon for Christmas Day. Source: Rev. John Mason Neale, D.D., Hymns of the Eastern Church. Fourth Edition. (London: J. T. Hayes, 1882), #25, pp. 64-65, edited by Very Rev. Stephen Georgeson Hatherly, Mus. B., Archpriest of the Patriarchal Æcumenical Throne. "The Word was made flesh." - John 1:14. 1. Christ is born! Tell forth His fame! Christ from Heaven! His love proclaim! Christ on earth! Exalt His Name! Sing to the Lord, O world, with exultation! Break forth in glad thanksgiving, every nation! For He hath triumphed gloriously! Sheet Music from Rev. John Mason Neale, D.D., Hymns of the Eastern Church. Fourth Edition. (London: J. T. Hayes, 1882), edited by Very Rev. Stephen Georgeson Hatherly, Mus. B., Archpriest of the Patriarchal Æcumenical Throne. Sheet Music from J. H. Hopkins, ed., Great Hymns of the Church Compiled by the Late Right Reverend John Freeman Young (New York: James Pott & Company, 1887), #67, 102-3. Sheet Music by Ch. Gounod from William Cooke and Benjamin Webb, eds., The Hymnary – A Book of Church Song. (London: Novello, Ewer and Co., 1872), #142, p. 119. "This is perhaps the finest, on the whole, of the Canons of Cosmas; and may fairly be preferred to the rival composition of S. John Damascene." St. John Damascene was the step-brother of St. Cosmas. Bend To Our Hymns, Redeemer - John of Damascus, Νευσον πρός ύμνους, οίχετων εύεξγέτα, from the Canon of Christmas Day; Also found in Bernhard Pick, ed., Hymns and Poetry of the Eastern Church (New York: Eaton & Mains, 1908), pp. 113-114. The Wonder-Working Master - John of Damascus, Εσωσε λαόν, δαυματουργών, from the Canon of Christmas Day; Also found in Bernhard Pick, ed., Hymns and Poetry of the Eastern Church (New York: Eaton & Mains, 1908), pp. 112-113. 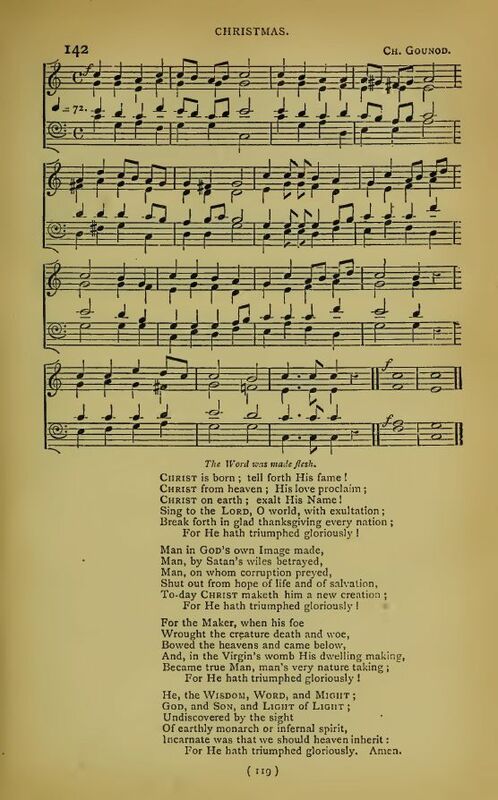 In 1868, this hymn appeared as "Christ is born ! exalt His name!" in the Sarum Hymnal, No. 45, and has passed in the same form into other collections. 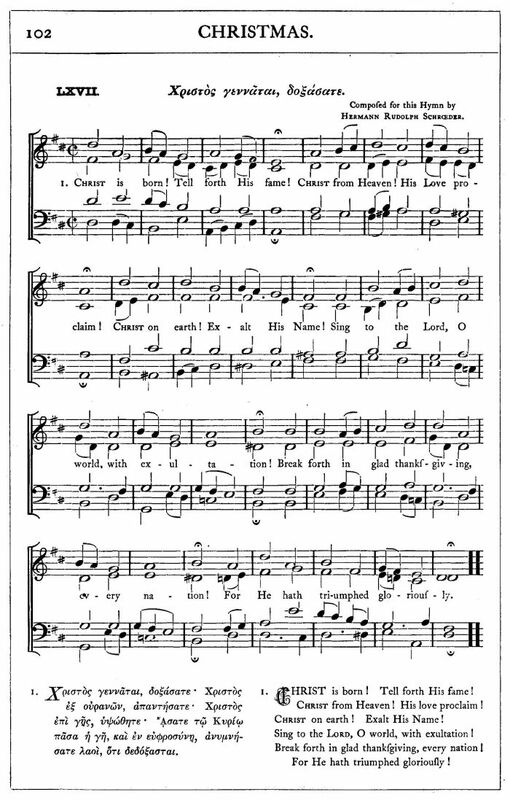 See: The Sarum Hymnal (Salisbury: Brown and Co. and W. P. Aylward, 1868), #45, p. 119. The original text was restored in the Hymnary in 1872, No. 142, p. 119 (1863), four verses with the tune by Charles Gounod. 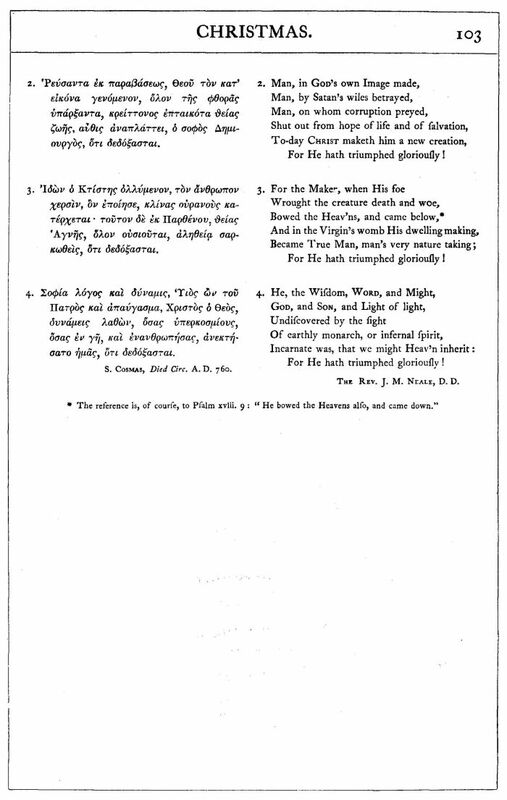 William Cooke and Benjamin Webb, eds., The Hymnary – A Book of Church Song. (London: Novello, Ewer and Co., 1872), #142, p. 119.